If you're looking for information on how to select and install a home photovoltaic system, here's the place to start. Whether you're a student, homeowner, contractor or installer, our tutorials will walk you through the entire process. Once you're up to speed on photovoltaic components, planning and design, you can shop for the best prices and/or search for contractors in your area to install the system. Or you can go look for a job in the booming residential solar sector. This website links to companies, suppliers, government agencies, research groups, nonprofits, sources of financing, free videos and downloadable guides. You can also access our sizing worksheets to simplify the math and measurements, or take advantage of one of our low-cost services. And don't forget to Like us on Facebook! 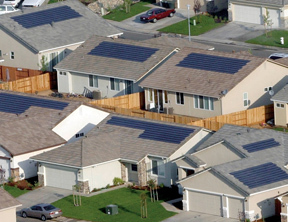 The latest spin on keeping up with the Joneses: Multiple residences in a new Rancho Cordova, California neighborhood take advantage of roof-mounted photovoltaic arrays to generate power. 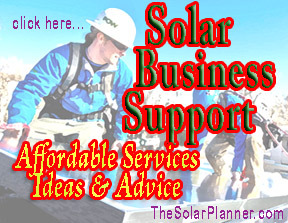 Be sure to bookmark TheSolarPlanner.com on your browser for future use. There's way too much material here to absorb in one visit. Check out the menu to the right or watch some videos below to get started. 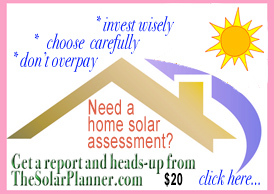 info [at] thesolarplanner dot com.